You have all seen The Producers, right? The version with Zero or Nathan, in the cinema, on TV, on the stage, whatever. Those of you who have not…well…tsk, tsk, tsk, for shame, for shame. Well, there is one scene that pops to mind apropos this book. In the film, the producers of the title have put together a show that is designed to fail. 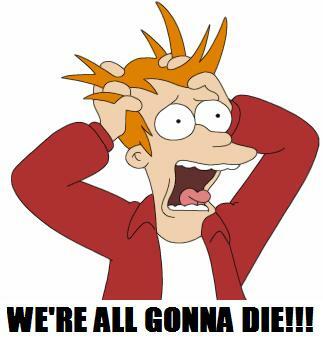 The surprise is on them, though, when their engineered disaster turns out to be a hit. During intermission of the opening performance, to Max and Leo’s absolute horror, they overhear a man saying to his wife, “Honey, I never in a million years thought I’d ever love a show called Springtime For Hitler. 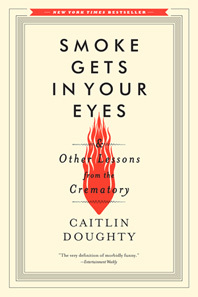 One might be forgiven for having similar thoughts about Caitlin Doughty’s sparkling romp through the joys of mortuary science, Smoke Gets in your Eyes. 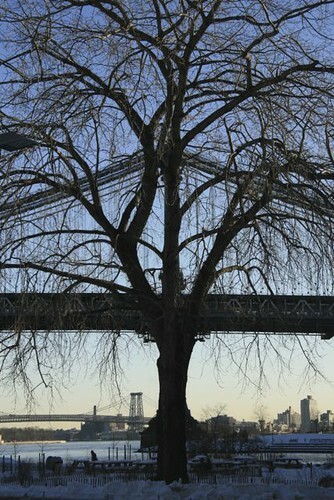 If you were expecting a lifeless look at what most of us consider a dark subject, well, surprise, surprise. Caitlin Doughty has cooked up a book that is part memoir, part guidebook through the world of what lies beyond, well, the earth-bound part, at least, and part advocacy for new ways of dealing with our remains. Doughty, a Hawaiian native, is a 6-foot Amazon pixie, bubbling over (like some of her clients?) with enthusiasm for the work of seeing people off on their final journey. Her glee is infectious, in a good way. The bulk of the tale is based on her experience working at WestWind Cremation and Burial in Oakland, California, her first gig in the field. She was 23, had had a fascination with death since she was a kid and this seemed a perfectly reasonable place in which to begin what she believed would be her career. Turned out she was right. 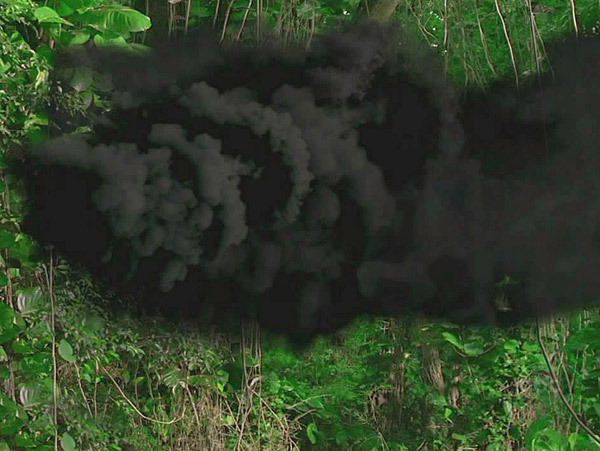 Smoke Gets in your Eyes is rich with information not only about contemporary mortuary practices, but on practices in other cultures and on how death was handled in the past. For example, embalming did not come into use in the USA until the Civil War, when the delay in getting the recently deceased from battlefield to home in a non-putrid form presented considerable difficulties. She also looks at the practice of seeing people off at home as opposed to institutional settings. There is a rich lode of intel in here about the origin of church and churchyard burials. I imagine churchgoers of the eras when such practices were still fresh might have been praying for a good stiff wind. Doughty worked primarily in the cremation end of the biz, and offers many juicy details about this increasingly popular exit strategy. But mixing the factual material with her personal experience turns the burners up a notch. The first time I peeked in on a cremating body felt outrageously transgressive, even though it was required by Westwind’s protocol. No matter how many heavy-metal album covers you’ve seen, how many Hieronymous Bosch prints of the tortures of Hell, or even the scene in Indiana Jones where the Nazi’s face melts off, you cannot be prepared to view a body being cremated. Seeing a flaming human skull is intense beyond your wildest flights of imagination. Beyond her paying gig, Doughty has, for some time, been undertaking to run a blog on mortuary practice, The Order of the Good Death, with a focus on greener ways of returning our elements back to the source. (Would it be wrong to think of those who make use of green self disposal as the dearly de-potted?) One tidbit from this stream was meeting with a lady who has devised a death suit with mushroom spores, the better to extract toxins from a decomposing body. I was drooling over the potential for Troma films that might be made from this notion. One of life’s great joys is to learn something new while being thoroughly entertained. Smoke Gets in Your Eyes offers a unique compendium of fascinating information about how death is handled, mostly in America. Doughty’s sense of humor is right up my alley. The book is LOL funny and not just occasionally. You may want to make sure you have swallowed your coffee before reading, lest it come flying out your nose. I was very much reminded of the infectious humor of Mary Roach or Margee Kerr . Doughty is also TED-talk smart. She takes on some very real issues in both the science and economics of death-dealing, offers well-informed critiques of how we handle death today, and suggests some alternatives. If the last face you see is Caitlin Doughty’s something is very, very wrong. The face itself is lovely, but usually by the time she gets her mitts on you you should be seeing the pearly gates, that renowned steambath, or nothing at all. Preferably you can see Doughty in one of the many nifty short vids available on her site. You will learn something while being thoroughly charmed. Reading this book won’t kill you, even with laughter, but it will begin to prepare you to look at that event that lies out there, somewhere in the distance for all of us, and point you in a direction that is care and not fear based. If you enjoy learning and laughing Smoke Gets in Your Eyes is dead on. I received this book from the publisher in return for an honest review. Well, not really. I mean they specifically said that there was no obligation to produce a review, so there is no quid pro quo involved, but it does seem the right thing to do, don’tchya think? You MUST CHECK OUT vids on her site. My favorite is The Foreskin Wedding Ring of St Catherine . All right, I’m gonna stop you right there. Go ahead. I know you wanna ask. No? Fine. I’ll do it for you, but you know this is what you were asking yourself. “If she rubs it does it become a bracelet?” Ok? Are ya happy now? Sheesh! If you are uncertain about making a final commitment to reading this book you might want a taste of the product first (That sounds sooooo wrong) Here is an article Doughty wrote about her first experience with death as a kid, from Fortnightjournal.com . There are several other Doughty articles on this site as well. Doughty offers a nifty list of sites to use for dealing with death, your own (presumably, you know, before) or others.